Last night I made my way to the London Indie RPG where six of us decided to give Witch: The Road to Lindisfarne (Pomey Crew Design, @PompeyCrewDesig) a go. Witch: The Road To Lindisfarne is a GMless role-playing story game for 4-6 players. In a single evening, players will collaborate to tell the story of the journey to a young woman’s absolution. They will explore the lingering pasts of a cast of characters, their relationships to each other, and decide their ultimate fates. I heard about this game at an earlier London Indie Meet, and have since been looking for an opportunity to try it out. Since there were six of us, we had the full roster of characters, Elouise (the accused witch) and the troupe of five leading her from London to Lindisfarne, where she is to be burnt alive. I chose the character Ham, a greedy, twitchy and cowardly character. Throughout the game I tried to find the answer to my characters three questions. Who is paying you to lead your companions? What offer would it take to betray your companions? One of the most interesting things about the game is that the player whose character is Elouise decides whether they are guilty or innocent at the beginning of the game, and a card representing this is placed in the centre of the table, under a larger card marked ‘The Truth’. This card is revealed in the penultimate part of the game, just before we hear what happens to our characters after the event at Lindisfarne. Over four main Acts, we explored different locations on the route. Tied to each location was a mood guiding the feeling of the company. We, not purposefully, forgot about this aspect in our game, not that it seemed to matter much. On the way our band dealt with bustling crowds in London, questioned party loyalties in Hangmman’s Wood, and dealt with a scene of a murder near Cliff Top Pass. It was also at Cliff Top Pass, that Ham had his most interesting moments. Whilst the other members were either away dealing with the scene of the murder or asleep around the campfire he spoke to Elouise and revealed that he had contracted the plague, (note: an important part of our story was that Elouise was accused of bringing the plague and one of the character’s sisters had also died from it). He bargained with Elouise to find him a cure, as she had some knowledge of herbs. She agreed but only promised to slow its progress and Ham set her loose in the woods to find the necessary ingredients. When the alarm was raised at the camp by two of the other characters, they rushed to find the rest of the party at the murder scene. Upon their return to the campsite Elouise and Ham were back in the ‘rightful’ places and Ham concocted a story of kidnappers and bribes, only to line his own pocket further. After some drama at Lindisfarne, one Knight refusing to carry Elouise to the pire, a squire admitting that it was his fault for the plague as he had renounced god, and Ham revealing he had been healed by Elouise by showing his scars where the boils were, we determined not to burn her. Which when we turned over the card in the centre turned out to be the right thing to do as she was innocent. Ham returned home with heavy pockets of gold, falsely claimed for compensation for paying of the ‘kidnappers’ but vowed to change his ways after paying of his debts and getting his sister safely back to their homestead. It is here that is was revealed that Elouise was right and that she had only slowed to plague and not cured it, a couple of small boils remained on his back. I really enjoyed the game we had, I think having a very tight structure for the game worked as there was still plenty of room for players to explore their characters relationships and history. I would be interested to see how the game plays with the same group, and how much variance their really is. However, it is clear that playing this with different groups would get different play experiences. Also its relative ease for setup and play compared to other games makes it great to play at short notice. 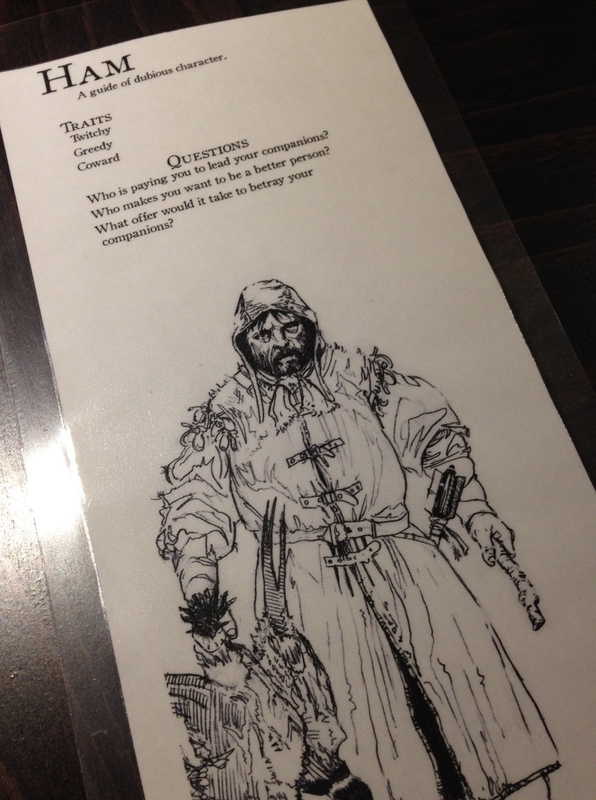 This entry was posted in Play, RPG and tagged indie rpg, London Indie RPG Meetup, witch on December 4, 2014 by davidpeterking.